The Whistling swan is the sister species of the Bewick’s Swan (C. c. bewickii) and are collectively referred to as tundra swan. In appearance C. c. columbianus is superficially similar to the Trumpeter Swan (Cygnus buccinators), although it is smaller with a distinctly different call (Drewien et al. 1999). Adults have a largely black bill, with a small yellow patch restricted to the base of the bill. This patch is variable in size and can be non-existent, resulting in confusion with the Trumpeter Swan with its entirely black bill. Whistling Swans have a long neck, rounded head, and black legs and feet, sharing these characteristics with the Bewick’s Swan. Cygnets are pale grey in colour on the upper parts, and whiter below. 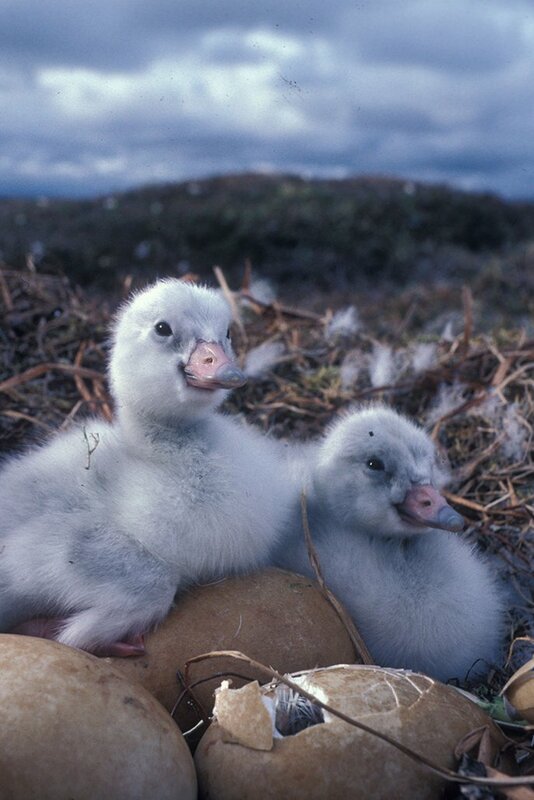 They have pinkish legs and bill which persist during the first winter (Limpert & Earnst 1994). Individuals become progressively white, usually starting at the head, and then progressing until the end of their first winter. Highly vocal, both in summer and winter. 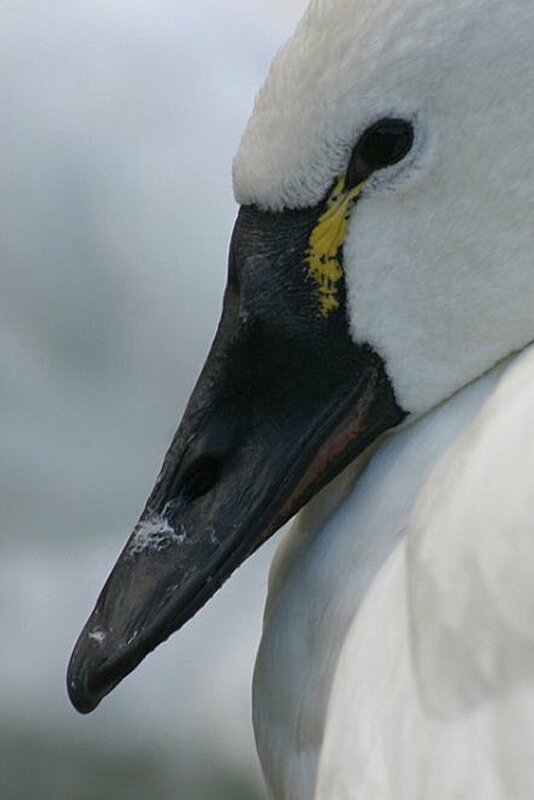 The calls are similar to those of the Bewick’s Swans but variation in tone allows separation of captive individuals by experienced listeners. Strength and pitch varies with social context, ranging from soft “contact” noises between paired birds and families and louder notes during triumph displays and greeting. During winter, flight calls are most frequent in the evening at large roosts, and can be heard for miles. Whistling Swans have a single wing moult during July-August each year and replace body feathers throughout the year. The Whistling Swan breeds across the arctic tundra of North America. There are two populations, the Eastern and the Western. Western population: This population breeds south of Point Hope in Alaska, typically wintering in inland valleys of California and locally in British Columbia, Oregon, Nevada, Utah and Montana. They also winter on the Pacific coast from Vancouver Island to central California. Eastern Population: This Population breeds east of Point Hope and winters on the Atlantic coast mostly from New Jersey to South Carolina, casual north to Maine and south to Florida (Limpert et al. 1991). 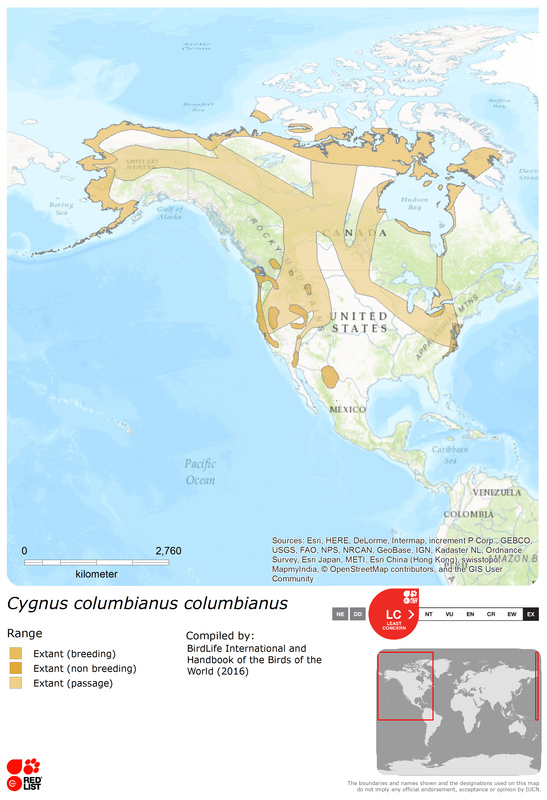 From: Wetlands International 2016, (1) U.S. Fish and Wildlife Service 2009, (2) U.S. Fish and Wildlife Service 2011. Breeds mainly on tundra lakes and pools, but favours coastal delta areas. This is shown by nest densities, which correlate positively with the availability of wetlands and length of shorelines (King & Hodges 1981). The Whistling Swan prefers to nest in areas with emergent littoral vegetation and pondweed, also small ponds near lakes and moist tundra lake edges (Earnst 1992). During migration they can be found on shallow ponds, lakes and riverine marshes, and occasionally on harvested agricultural fields. Wetlands containing Sago pondweed (Potamogeton pectinatus) are favoured for foraging, regardless of size or extent of open waters, whereas non-foraging swans preferring large wetlands with open waters (Earnst 1994). Open waters are also important for roosting during non-breeding season, but roosts almost exclusively on land in the breeding season (Limpert & Earnst 1994). Human hunting (Bartonek et al, 1991). Lead poisoning due to ingested lead fishing weights and lead shot (Limpert & Earnst 1994). Loss of arctic breeding habitat due to oil and gas drilling. Bartonek, J.C., Serie, J.R. and Converse, K.A. (1991). Mortality in Tundra Swans Cygnus columbianus columbianus. Wildfowl Spec. Suppl., 1: 356–58. Drewien, R.C., Herbert, J.T., Aldrich,T.W. and Bouffard, S.H. (1999). Detecting Trumpeter Swans harvested in Tundra Swan hunts. Wildl. Soc. Bull. 27: 95–102. Earnst, S.L. (1992). 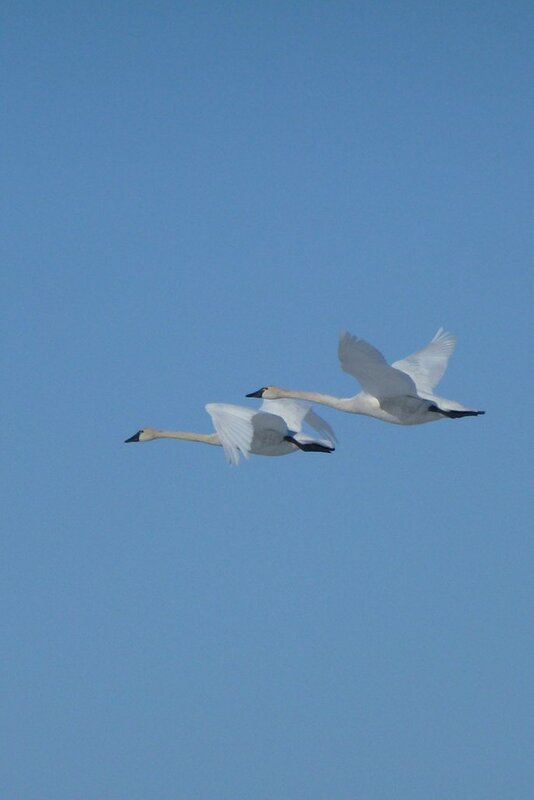 Behaviour and ecology of Tundra Swans during summer, autumn and winter. Unpubl. Ph.D. thesis. Ohio State Univ., Columbus, US. Earnst, S.L. (1994). 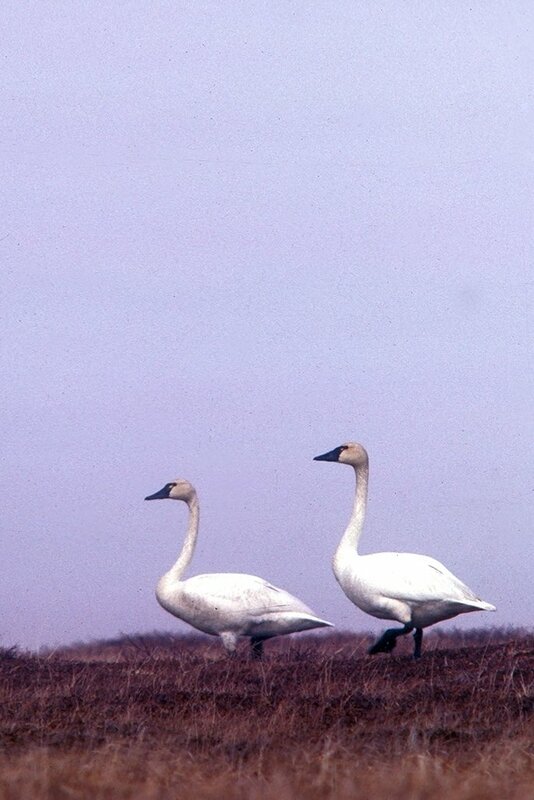 Tundra Swan habitat preferences during migration in North Dakota. J.Wildl. Manage. 58: 546–51. King, J.G. and Hodges, J.I. (1981). A correlation between Cygnus columbianus columbianus territories and water bodies in western Alaska. In 2nd IWRB Int. 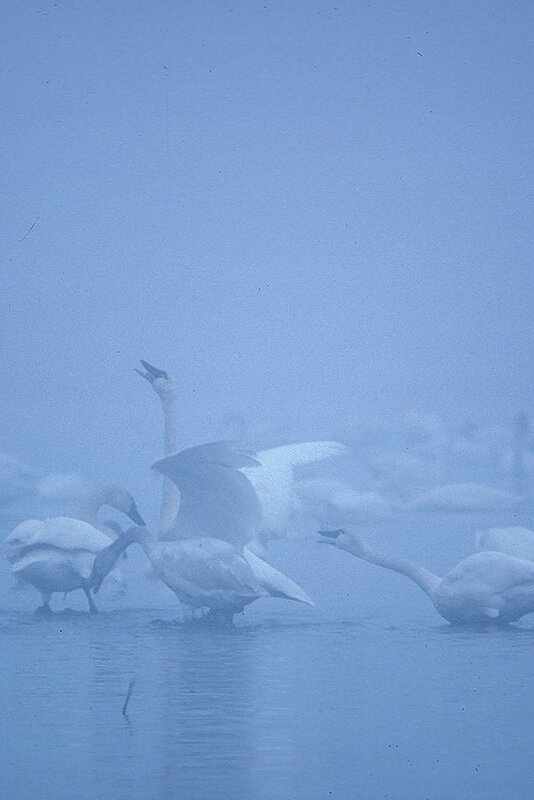 Swan Symp., Sapporo, 1980 (ed. G.V.T. Matthews and M. Smart), pp.26–33. IWRB, Slimbridge, UK. Limpert, R.J. and Earnst, S.L. (1994). Tundra Swan (Cygnus columbianus).The Birds of North America, No. 89 (ed. A. Poole and F. Gill).AOU,Washington, and Academy of Natural Sciences, Philadelphia. Limpert, R.J., Sladen,W.J.L. and Allen, H.A., Jr (1991).Winter distribution of Tundra Swans Cygnus columbianus columbianus breeding in Alaska and Western Canadian Arctic. Wildfowl Spec. Suppl. 1: 78–83. U.S. Fish and Wildlife Service (2009). Waterfowl population status, 2009. U.S. Department of the Interior, Washington, D.C. USA. Wetlands International (2016) Waterbird Population Estimates. Available from: wpe.wetlands.org [Accessed Feb 2018].